A 19-member Board of Directors provides governance to E-Comm and is responsible for overseeing the Corporation’s strategic direction, finances and operating results. Management is accountable to the Board of Directors for the day-to-day operations and administration of the Corporation. The members of the Board of Directors, nominated by E-Comm shareholders, provide extensive knowledge and experience to the Corporation through their work on the Board and as members of the Board’s standing committees. These committees are the Audit committee, the Human Resources and Compensation committee, and the Governance committee. 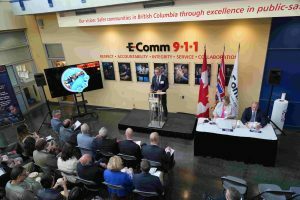 In addition, E-Comm ensures that it meets its partners’ needs through User and Service committees comprised of representatives from police, fire and ambulance.